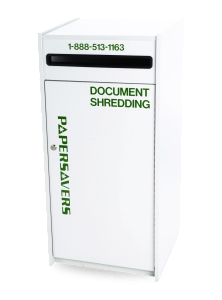 Papersavers offers a FREE 30 day trial for on-going shredding services in order to help us determine a tailored shredding program for your office. We will assist in determining the quantity and type of collection containers best suited for your needs. There is no contract to sign and absolutely no long term obligation at any point. This collection container has a removable lid and is ideal for offices that don’t require in-office security. This container is made out of very thick cardboard and is easily moved around the office. This container is locked therefore it restricts access to confidential material. This collection container is recommended if in-office security is required and if the collection container will be kept in your office as it is the most esthetically pleasing. This container is on wheels and locks therefore it restricts access to confidential material. This collection container is recommended if in-office security is required and if it will be kept in a warehouse or somewhere similar as it is the largest of our container options. Offered weekly, bi-weekly, monthly, or bi-monthly. Scheduled clients receive discounted pick-up rates and are not required to pay deposits for their collection containers. 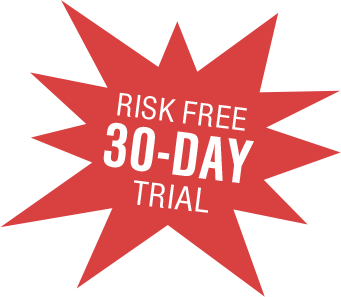 Generally provided within two business days of your request (plant-based), or within five business days of your request (on-site) depending on your location. One-time fully refundable deposits are required for on-call clients. There are no minimum pick-up requirements therefore this option is ideal for customers that generate small or inconsistent volumes. 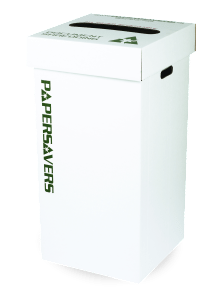 Papersavers offers both Plant Based Shredding and On-Site Shredding services. Both services are certified through the Nationaal Association for Information Destruction (NAID) which assures you our policies and procedures meet the highest industry standard. Our trucks remain locked at all times which ensures your material is securely contained while in transport. The choice comes down to personal preference as both options are secure methods of destruction. All material will be shred on the day of removal. You will be given a signed Certificate of Destruction immediately at the time of the pick-up verifying complete destruction that day. 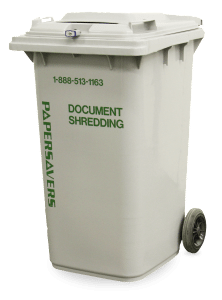 All material will be shred at your facility immediately upon arrival. You will be given a signed Certificate of Destruction for your records. Please Note: Applicable pick-up/service charges and minimums may also apply. Please contact us for a formal quote to reflect all appropriate charges.